Finally got around to starting the front suspension rebuild. This will be a big project, so I'm breaking it up into removal, clean-up and reassembly. I need to replace both lever arm dampers (LADs) as they are leaking pretty badly and inner wishbone bushes which are pretty much shot. To do this I need to remove the wishbone arms and undo the top and bottom trunnions. First up is releasing the spring. This is best done by raising the front up onto jack stands (positioned on the box sections where they emerge at the rear of the engine bay) and then using a trolley jack under the spring pan to release the pressure. Then the idea is to undo the inner spring pan bolts and slightly undo the outer ones, letting the pan pivot down as you release the jack. This should gently release the spring, allowing you to drop it out. Unfortunately 2 of my pan bolts were jammed tight with rust. On I drilled out, but the one attached to the drop-link wouldn't shift, which meant the spring pan moved very reluctantly, but the spring was eventually released with no drama at all. Next up was the top trunnion. This took a lot longer, lots of release spray, blowtorch heat and hammer blows to finally drift the bolt out. This was by far the hardest item to shift in the whole disassembly and just took patience. Even with the top trunnion ready to pull, the hub assembly was still held by the steering link. This is another tough nut as while the actual nut came away relatively easily, the thread sticks and requires simultaneous hammer blows to opposing sides to pop the connection. Again, this takes a bit of patience, but when it works the link pretty much 'pops' out. The lower trunnion came apart easily, allowing me to remove the hub assembly. Now I have the wishbones with spring pan and drop-link still attached. 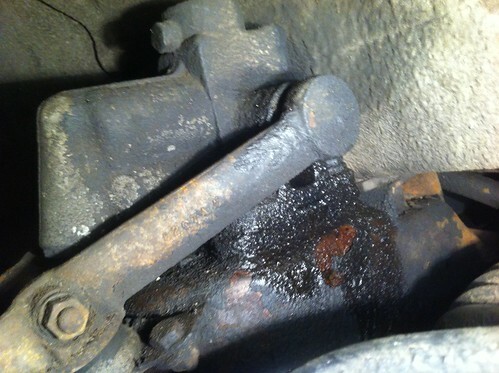 The inner wishbone nuts were seized solid, not helped by the split pins having rusted in place to the point where they broke when trying to pull them. With new wishbones and drop-links likely, I decided to plumb for a full replacement kit which would allow me to just remove the pivot arms. This meant I could drop the wishbone, spring-pan and pivot arm as one lot for later disassembly when I had more time. The LAD was the easiest thing to remove in the end - just 4 bolts and it was off, ready for exchange for some reconditioned ones. The final thing to complete before clean-up and reassembly was to remove the old bushes from the top trunnion. This was done using a couple of sockets and a G-clamp and bench vice to push them out. Next up, cleaning up the hub assembly and crossmember ready to take the new parts.